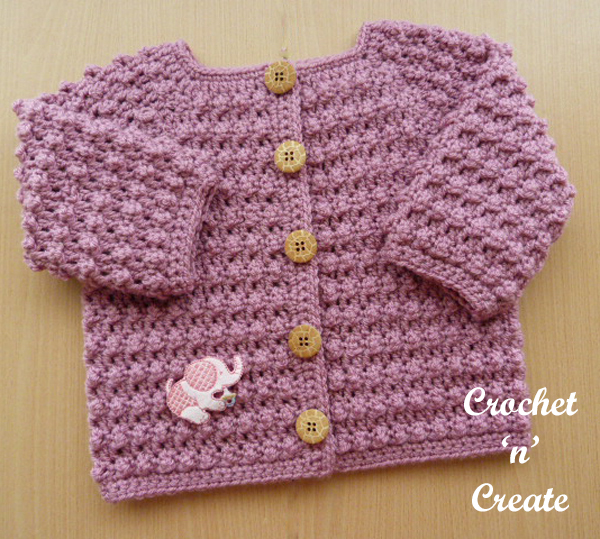 Knobbly baby cardi – An ideal garment to slip on over a top, dress or boys shirt. The pattern for this design is in a raised textured stitch comprising of just two rows. 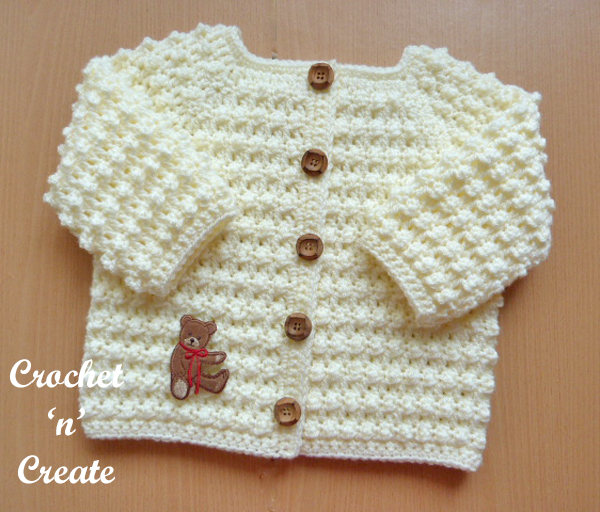 A soft cuddly cardigan which will give baby that extra bit of warmth when required or just to make them look smart. 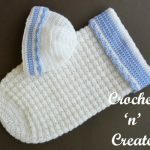 see more of my free baby wear below, just click on the pictures or links to get the free crochet patterns. ch56, 1dc in 4th ch from hook, 1dc in next 6ch, (front), 3dc in next ch, 1dc in next 8ch, (sleeve), 3dc in next ch, 1dc in next 18ch, (back), 3dc in next ch, 1dc in next 8ch, (sleeve), 3dc in next ch, 1dc in next 8ch, (front). Turn (61dc + ch3). Rpt 2nd & 3rd Rows four more times or until 141dc + ch3 remain. Rpt Pattern Rows 1 & 2 six more times until you have 13trc rows worked in all from beginning. Turn. Next Row – ch1, 1sc in base of ch1, 1sc in each stitch to end. Turn. Rpt last row twice. DNT after the last row. Button/Buttonhole Bands – With RS of work facing, working along right hand front edge, work 41sc evenly in row ends along first front edge, 3sc in corner, work 1sc in each ch around neck, 3sc in corner, work 41sc evenly in row ends down second front edge. Turn. Button Band – ch1, 1sc in base of ch1, work 1sc in each sc to the corner. Turn. Row 3 – ch3, 1sc in next dc, * 1trc in the next dc, 1sc in next dc, * rpt from * to * to end, sl st to top of ch3 on beginning of row. Turn. Rpt Rows 2 & 3 five more times. Turn. Next Row – ch1, 1sc in base of ch1, 1sc in each sc to end, sl st to first sc on beginning of row. Turn. Finishing – Close the two small gaps under arms, weave in and trim off any loose ends of yarn, sew on the buttons to correspond with the buttonholes. 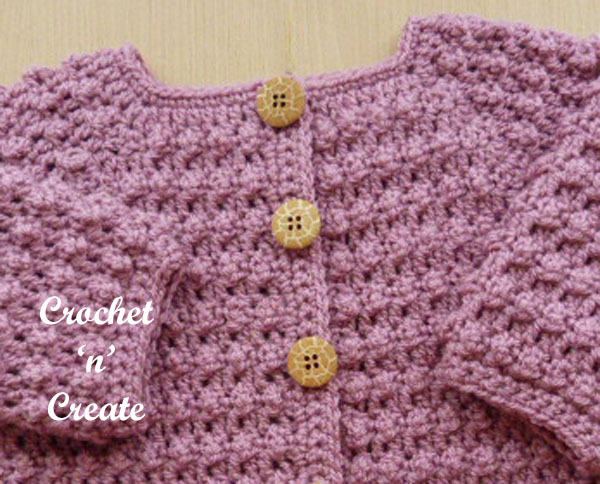 Speak to you soon with another free crochet pattern. If you wish to print the pattern text only of the knobbly baby cardi, select the content you want to print, click file (top left corner on browser), then print, this should take you to your printer settings, choose selection and then OK. 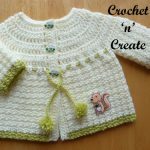 The written instructions and pictures for this cute knobbly baby cardi crochet pattern are copyrighted to crochet ‘n’ create © 2017. 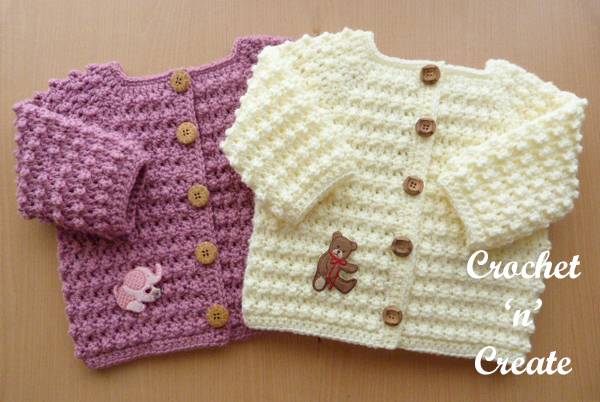 You are welcome to sell the finished products made from the free knobbly baby cardi crochet pattern, I just ask that you put a link back to crochet ‘n’ create. 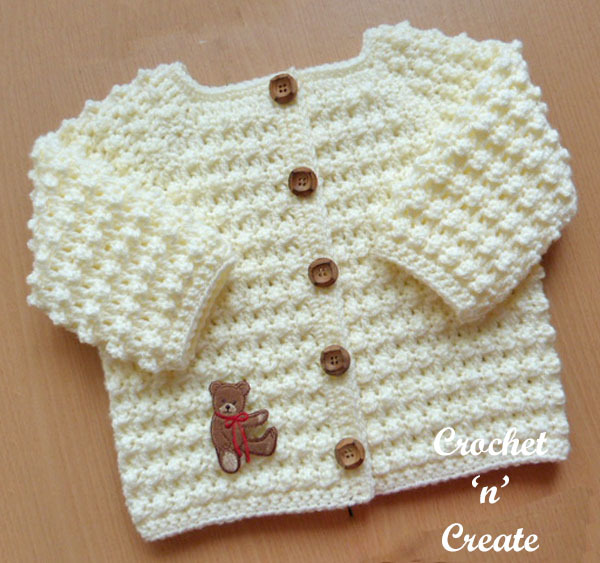 If you wish to share this knobbly baby cardi crochet pattern on social media or your blog please only use a direct link to the pattern page on crochet ‘n’ create. 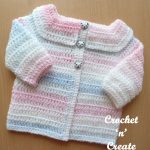 This entry was posted in Baby crochet pattern, crochet baby cardigan and tagged baby crochet, baby crochet cardigan, baby crochet sweater, free baby crochet pattern on 30th May 2017 by crochetncreate. Another stunning masterpiece and well-written, easy-to-follow pattern from Heather! THANK YOU! Your patterns are really great and I love this one so much. 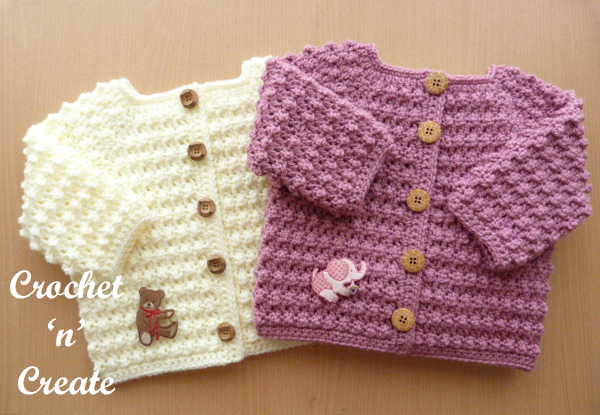 One question: where can I buy the animal buttons you always put on your crochet baby items? They are so pretty! Thanks in advance!